Introducing the C6-S, the newest member of the Advanced Series family. The Advanced C6-S is Celestron’s first new Schmidt-Cassegrain optical system in over a decade. A totally unique aperture size, the C6-S is available in computerized (GT) and non-computerized models. NEW 6” Schmidt-Cassegrain features a precision optical system with 1500mm focal length (f/10) and offers 40% more light gathering than a 5” telescope. All C6-S models come standard with Celestron’s StarBright® XLT coatings at no extra cost. Ultra stable mount with RA and DEC slow-motion controls and setting circles. CG-5 Mount: Precision engineered for stability. Celestron’s new German Equatorial mount has precision worm gears on both axes for extremely smooth movement and great stability. The key element that makes this system the most stable in its class is the NEW heavy-duty tripod with larger and more substantial legs (2″ stainless steel! ), and the beefy center tray, both of which offer excellent damping characteristics for more stable views. The CG-5 also has a convenient latitude scale for easier alignment and an optional polar finder scope for the ultimate in precision alignments. My background: Novice Amateur Astronomer. My equipment: Meade 2045 LX3 SCT Meade DS2090AT-TC Refractor Celestron C6S XLT SCT My Celestron C6S XLT is mounted on a Celestron CG5 manual mount that I have converted using the iOptron GOTO Nova kit. I purchased the C6S last winter when Celestron discontinued the manual model and sold them at a discount. The telescope and mount arrived in two separate shipping boxes; both designed to protect their contents. The telescope was embedded in rubber foam cut to form fit its delicate cargo. The CG5 mount and tripod were protected the conventional way with foam packing and cardboard spacers. Assembly was straight forward. Note: (I have a iOptron Nova GOTO Kit installed on the CG5 mount which I will review separately after I gain more experience with it.) Being a novice, I have difficulty star hopping. My plan was to use my Meade DS telescope’s goto feature to show me where objects are located then manually find the objects with the manually operated CG5 GEM mount that came with my C6S. First Light: (Note: I did not make a log of my first night so can not identify some of the Messier objects I viewed. Seeing that night was great, perhaps the best that I have ever experienced but the moon was full.) The C6S comes with a 6x30 finder scope. The optics of the finder scope are excellent. I have a very cheap 7x50 binoculars that I use from time to time. Even though the binoculars have a greater light gathering capacity, the finder scope shows dimmer stars. Often Messier objects are faintly visible in the finder scope and invisible in my 7x50 binoculars. I chose Polaris as my first target to see how well the telescope’s collimation survived shipment. Polaris was a sharp spot of light with a tiny black dot in its center flicking in and out of view. A star test even at high magnification indicated that the scope’s collimation was excellent. In and out focus patterns were nearly identical and the airy disk centered even at high magnification. The foam rubber padding Celestron uses in its shipping carton apparently protects the scope very well. Next, I aimed the scope at the Great Nebula in Orion. This proved more difficult that I imagined as this was the first time I had ever used an equatorial mount (my other scopes have azimuth mounts) and I found the process very cumbersome and not intuitive. More on mounts later. Back to the telescope. I was simply blown away at the view of the Orion Nebula. Even at low power the four stars of the trapezium were clearly visible and details of the nebula were clearly visible. All were sharp and clear. Next I went to a global cluster. All I can say is WOW! In my 90 mm refractor and 102 mm SCT the global cluster was a grey smear with a sprinkling of stars. In the C6S the cluster was breath taking; thousands of sparkling diamonds in the sky and definitely worth my frustrating trial with the unfamiliar equatorial mount trying to find it. I tried to find some galaxies but my inexperience with a GEM mount rapidly defeated that endeavor. The Meade DS goto mount had no problem showing me where to look but I simply could not make the GEM go where I wanted it to go. I decided that first night that my plan to manually find objects in the sky using my Meade DS goto mount to show the way was fatally flawed. (Note: I ordered iOptron’s Nova GOTO kit the next day.) Finally, I looked at the moon. Again WOW. I put a 6 mm eyepiece (250 power) and focus remained shape with surface details standing out. For the heck of it, I used a 2X Barlow with the 6 mm lenses (500 power) and the view was like being in an airplane looking down on the surface of the moon moving below. (NOTE: I have not been able to repeat this performance since that first night with its clear and super steady skies.). Summation: I am extremely satisfied with my C6S Schmidt Cassegrain Telescope and its optical performance. It has far exceeded my expectations for a 150 mm scope and will meet my needs for many years to come. The Celestron CG5 mount that came with the scope is definitely overkill for the scope’s size and weight. Had I known how “non-portable” the mount is, I would have not purchased the scope . Portability is very important to me which is why I wanted a 150 mm SCT in the first place. I readily admit, that I did not do my homework properly and just leaped too fast to take advantage Celestron’s “fire sale” price when they discontinued the C6S XLT with a manual mount. That is a “shame on me” not on Celestron. 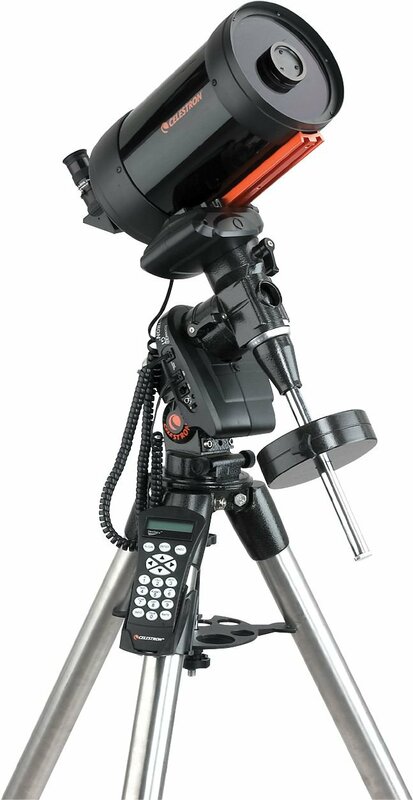 The Celestron CG5 mount is very sturdy and, with the small C6S, essentially vibration free. I even lean on mine for support from time to time and it remains rock solid. However, this solid rock of a mount comes with a price. The C6S scope weighs a little over 4 kg, about 10 pounds. It is compact. I can place it in my leather carrying case that I used to transport my Meade 2045 SCT as carry-on baggage aboard airplanes. The CG5 mount with its 2 inch stainless steel legs, counter weight, etc. is heavy. It is movable but does not fit my definition as portable. This brings one to the weakness of Celestron’s C6S Schmidt Cassegrain Telescope on any version of the CG5 mount (manual, motorized, or GOTO). WHY buy it unless you want a cheap entry into Astrophotography? The CG5 mount is super rock solid with the lightweight C6S SCT and provides an excellent low cost platform for astrophotography (this is especially true if you open up the CG5 mount and replace all the tacky Chinese grease with synthetic lubricants.). I suspect if the mount were sentient, it would not even be aware it was carrying a load with the C6S mounted on it. If astrophotography is not something you want to do, then for a few dollars more, you can purchase the C8 with its 200mm aperture and even then still have some photography capabilities. If you want a 150 mm SCT for its portability attributes, the Celestron NexStar 6 SE provides the same optics in a portable version on a goto mount that can be used in both azimuth or equatorial modes. My over all rating: The C6S gets a 10 out of 10 for optical performance. The CG5 mount is great if you want a GEM, a low cost entry into some serious astrophotography, and portability is not important. If portability is important and you are not really interested in astrophotography, then the NexStar 6 SE is probably the better choice.